Do you ever get a sense of déjà vu? When you get a creepy feeling that you’ve been there before or experienced something before? On Saturday, December 13, I was participating in a #BlackLivesMatter march down 4th Avenue in downtown Olympia, Washington, with about 50 other people. We were in the middle of the street and it was dark, cars were honking in anger or support, and protesters were chanting about racist violence, militarization, and the police. That’s when the déjà vu hit me . Of course, I had heard it all before. 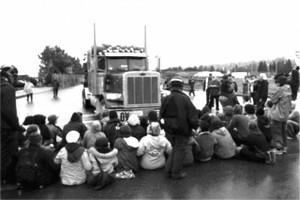 Only seven years ago, a few blocks to the north, antiwar protesters had blocked the Port of Olympia. They were keeping armored vehicles from being shipped between Fort Lewis and the killing fields of Iraq. The port protesters were facing down the police who were protecting military equipment, so it could be sent against brown-skinned people in a foreign land. Now, we were marching because similar armored vehicles were being brought back from Iraq to be deployed in the “homeland.” They were being deployed for the oldest and longest war that the United States has ever fought—against black and brown people on American soil. Instead of occupying Iraq or Afghanistan, they were occupying the streets of American cities. The militarization of the police is causing the deaths of more and more African Americans and others, so that every new police killing becomes a déjà vu of the last one. We live in a country where not only are the police being militarized, but an overseas military intervention is officially termed a “police action.” When soldiers return from Iraq or Afghanistan, sometimes the only job they can find is in law enforcement or private security firms, and their military training causes some of them to see potential enemies everywhere. And because there are fewer jobs available in the U.S., the same kids who are harassed by cops in their own neighborhoods have few options other than to join the military to harass other kids abroad. In 2015, we shouldn’t be so surprised that the war is coming home, because it’s always been here. When martial law was declared in the African American neighborhoods of New Orleans after Hurricane Katrina, private Blackwater mercenaries were flown directly from Baghdad to enforce it. When the U.S. torture chambers in Abu Ghraib prison were exposed, it was revealed that one of the torturers had come directly from the prison-industrial complex in Pennsylvania, where he presumably had learned his tradecraft on African American and Latino inmates. The grand jury refusal to indict the killer of Eric Garner came the same week as the release of a Senate report on the CIA torture empire that has grown since 9/11. Part of the report focused on waterboarding, a torture technique (stretching back to counterinsurgency wars against Native America and in the Philippines) in which the victims are nearly drowned to extract information or confessions. In other words, the purpose of waterboarding is to prevent a person from breathing, much like the police chokehold that caused Eric Garner to gasp for air. We don’t know the names of most of the civilians who have been killed in Iraq or Afghanistan or in U.S. bombings in Pakistan, Yemen, Somalia, Libya, Syria, and countless other targeted “tribal regions.” But we can better understand their suffering through the voices of the mothers of Eric Garner, Michael Brown, Tamir Rice, John Crawford, Trayvon Martin, John T. Williams, Aiyana Jones, and the countless other targets of racist killers. We can have more empathy for civilians abroad by understanding this war at home and, conversely, have more solidarity with civilians here by understanding the wars abroad. If repressive techniques are successfully tested on foreigners or immigrants, they are then inevitably brought to be used on citizens. If cops and armed white citizens can commit violence with impunity in the homeland, it enables even greater violence elsewhere. Two hours before the Olympia youth rally, and a few blocks south at the Washington State Capitol, 1,000 gun-rights activists held an “I Will Not Comply” rally against a new voter- mandated state law for background checks on gun owners. The camouflage-clad militants openly brandished automatic assault weapons and passed them freely to each other. The Washington State Patrol claimed it witnessed no violations of the law at the rally. These protesters were almost all white and they flew at least one Confederate flag. The same double standards apply to wars abroad. 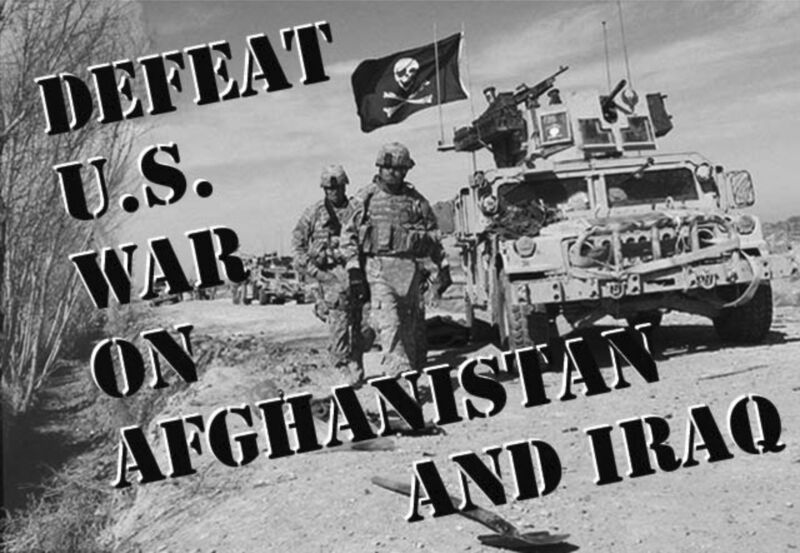 When the enemies of the U.S. launch wars, they are “committing genocide” or “ethnic cleansing.” When the U.S. and its allies launch wars, they are “defending freedom,” or carrying out “humanitarian interventions.” Even at times when the military is called on to stop genuine dangers, it generally ends up killing more civilians and alienating its own allies. In much the same way, a family that calls the police to restrain a mentally ill relative sometimes regrets the decision, when the cops end up causing more harm than good. 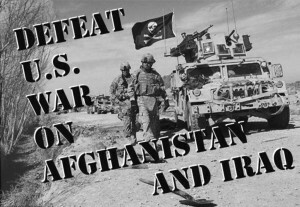 The attention of the American public is moving away from overseas wars, because the Pentagon’s shift to bombers and drones, and proxy armies and mercenaries, has caused lower casualties among U.S. troops. But public attention is shifting toward the war at home, where it will be more difficult to automate or outsource the war, and it will be more difficult to hide it from evening commuters or even football fans. And if more Americans lose their faith in the local police department as our protectors, they may begin to rethink the Pentagon as our protector as well. 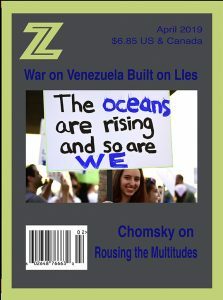 Since President Obama’s election in 2008, conservatives and progressives alike have declared the “death” of the antiwar movement, but strong antiwar sympathies caused a lowering of troop levels in Iraq and Afghanistan and prevented wars against the Syrian and Iranian militaries, but could not prevent the new bombings of Iraq and Syria. Certainly, the antiwar movement is not as visible or vocal as it was during the Bush years, if we only look at opposition to the wars abroad. But if we see the upsurge in Ferguson, New York, and the entire country as opposing the racist militarization of American society and the “war at home,” the current upsurge is one of the strongest antiwar movements we’ve ever seen. It has stronger leadership from people of color, is rooted in a wide range of communities, and its protests have been sustained over months. Black Lives Matter is far more multiracial and multigenerational than earlier uprisings against the war at home, such as the 1992 Los Angeles rebellion. The youth who are taking the lead in the recent protests are not playing politics as usual and will not easily go back to a compliant acceptance of militarization, either at home or abroad. I’ve witnessed many social movements and it feels different this time. Déjà vu means “already seen,” and that’s just the problem. We’ve already seen genocide and lynchings in our history. We’ve already seen kids shot down in cold blood and their killers get promoted. We’ve already seen police and military alike trained to strike at peaceful civilians with their “hands up,” for the crime of challenging the empire or merely for being in the way. We’ve already seen social movements blossom, get intimidated or coopted, and then wither away. But history doesn’t always have to repeat itself because the cycles exhaust themselves and eventually hit a wall. A tectonic generational shift is underway that we are only beginning to perceive. Upsurges such as Occupy, Idle No More, Climate Justice, and Black Lives Matter may either gradually release tension in the fault lines, or serve as harbingers of more intense shake-ups ahead. If, in our cynicism and fatalism, we think that we’ve “already seen” it all, we may be surprised by how quickly change can and does happen. Things will not always stay the same and old patterns do not have to be repeated. 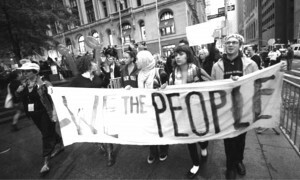 If social movements remain brave and unpredictable, they can move mountains. Zoltan Grossman is a professor of Geography and Native Studies at Evergreen State College in Olympia, Washington. He has been a warm body in peace, justice movements for the past 35 years.